Heaven help me, I love The Last Starfighter. For all its over-the-top, gee-whiz, Star Wars-lite tomfoolery, it’s actually a really fun movie. It encapsulates many of the things I love about films from the 1980s: The big hair, fun-loving teenagers, exciting action and, most of all, great music! None of this makes it a good movie, but it comes close. A Video Game… in Space! 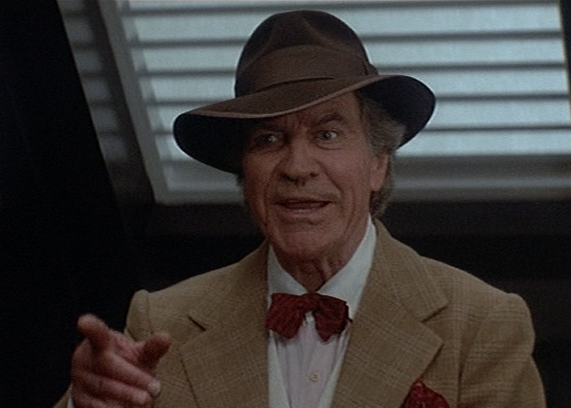 The Last Starfighter, appropriately enough, feels a lot like a video game. 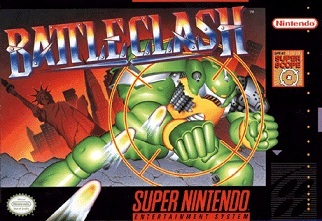 If you don’t believe me, go back and play Battle Clash on the Super NES (you know, the game that used the Super Scope) and you’ll feel like Alex Rogan in the cockpit. In that game, you shoot missiles at various robotic enemies and you have to shoot enemies’ missiles before they hit your robot while someone else pilots your robot. That actually sounds a lot like Robot Jox, except with a copilot. The big difference between this and an SNES video game is the music. Composer Craig Safan, who spent most of his career working in television, delivered a slam-bang score for The Last Starfighter that rivals just about anything produced by James Horner in the ‘80s. From the first shot of the film, we know we’re in for a fun ride. We’re staring at a computer-generated earth while triumphant music is playing, and then we suddenly start moving backward at tremendous speed, going through some sort of wormhole and passing all sorts of worlds. Maybe the filmmakers didn’t want to seem like they were copying the opening of Superman: The Movie too much by going forward through the galaxy. We don’t actually get somewhere important to the story during our first outing into space, but I guess it just sets up the fact that outer space travel is on the table while we deal with a seemingly earthbound story. In short order, we’re introduced to a little kid named Louis Rogan. For some reason, a lot of films in the ‘80s had at least one character who is a pervert. In Ghostbusters, it’s 32-year-old Peter Venkman; in Adventures in Babysitting, it’s 15-year-old Daryl Coopersmith; in The Last Starfighter, it’s 10-year-old Louis Rogan. Yeah, I can understand longtime bachelors and teenagers being obsessed with that kind of thing, but a little kid? Anyway, Louis is in the movie for two reasons: to provide comic relief and shout about how cool his big brother Alex is. Despite being stuck in a poor provincial town, Alex beats a first-person shooter arcade and is promptly visited by the second-best character in the movie – Centauri. Centauri is an alien played by Robert Preston, best known for his zany performance as Harold Hill in The Music Man (1962). 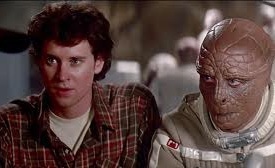 The Last Starfighter was the last theatrical film of his career and he sure makes it a memorable swan song. You can tell he’s having fun as he talks a mile a minute and tries to sell Alex on the idea of becoming an intergalactic warrior. When he’s not running off screen, Centauri is stealing every scene he’s in. But the best character in the whole movie is a lovable alien named Grig. Grig is played by Dan O’Herlihy, who you may recognize as The Old Man in RoboCop. I prefer to remember him as the pilot who has to drop a nuclear bomb on New York City in Fail-Safe (1964). That’s definitely a Forgotten Film Gem that I’ll talk about in a future article. Anyway, Grig is the pilot of a starship and Alex is the gunner. Grig is always offering helpful advice, inspiring Alex to take up the mantle and fight the good fight. He has a friendly demeanor and a memorable laugh that makes you feel right at home with him despite his alien appearance. And he has my favorite lines in the movie. When Alex learns that it’s just them against hundreds of enemy ships, he exclaims, “It’ll be a slaughter!” Grig happily replies, “That’s the spirit!” Later, Alex tries to explain that he lives in a trailer park, but Grig only knows about living in caves, so Alex improvises a description. To make sure he understands, Grig summarizes: “A mobile cave that never went anywhere. Fascinating.” Oh, those crack me up every time. Alex and Grig have to take on a whole army of evil aliens bent on taking over the universe. My two favorite musical cues come near the end. The first is when Alex and Grig chase a spaceship into an asteroid. The music adds to the suspense and lends another dimension of danger to the already-impressive special effects. It all builds up to the point where Alex has no other choice but to take a life for the first time ever. After killing the alien, he suddenly feels the weight of what he is doing and he decides he wants no part of it. Luckily, Grig is able to convince him otherwise and they go off to have an awesome final battle. The second music cue I love is when Alex and Grig charge into battle with very little plan except stay alive. They just go all out, using the dreaded Death Blossom to blow up every spaceship in range. It’s an awesome scene. The music really ramps things up after that when the Command Ship prepares to ram Alex and Grig’s spaceship. This scene was nail-bitingly intense for me as a kid and it still puts me on the edge of my seat thanks to the superb music. The theme is reminiscent of the music when Marty McFly is trying to restart the Delorean time machine to get back to 1985 at the climax of Back to the Future. Also, when the Command Ship crashes into a moon and the main theme blasts triumphantly, you can’t help but smile and take a breath of relief. The reason The Last Starfighter isn’t a particularly good movie is because it’s incredibly silly and is little more than an excuse to show off its, admittedly groundbreaking, special effects. Alex whines a lot and he is actually less interesting than the Beta Unit sent to replace him on earth while he’s defending the universe. Beta is supposed to distract the bad guys, but it doesn’t make any sense to me how they could even get to earth when the whole plot hinges on the fact that they’re stuck outside a Great Barrier. That’s another thing I don’t understand. Space isn’t like the earth. Here on earth, if we want to build a barrier like, say, the Great Wall of China, we just have to build it a certain distance long and high to keep people from just walking around it or climbing over it. But in space, it’s fairly easy to get around a fence that’s a finite distance long and high, as was demonstrated in the Exxon Valdez episode of Futurama. So the Great Barrier that the bad guys are trying to break through would have to be millions of light years in height and length to be effective. How can it generate enough power to do that? It just seems so impractical and poorly thought out. There are many other problems with the movie, but they can mostly be forgiven because of the amazing music that backs them up. It’s no Star Wars, but The Last Starfighter is definitely worth a watch. All clips are the copyright of their respective owners. This entry was posted in Bad Movies with Great Music and tagged 1980s, action movies, film score, films, fun, funny, last starfighter, movie review, movies, music, robocop, science fiction, soundtrack, video game. Bookmark the permalink.